As high the requirements for sewing thread are, as high are the requirements for the finish-winder. The final sewing thread package, whatever shape it is, is also a marketing tool for the thread producer - thus it has to be perfect. Would it surprise you, when we say: "A perfect package is only possible with a perfect winder". A perfect sewing thread Finish winder has to fulfil several important requirements: - ensure a consistent quality & easy reproducibility of sewing thread make-ups - high production performance & flexibility to meet fast changing market demands - reliable operation - minimum conversion costs. The various specifications of sewing thread, as well as the marketing of the producer, lead to a vast array of different make-ups, depending on the thread properties, the end-use application and the final market segment. SSM offers the right finish winder for your specific application. 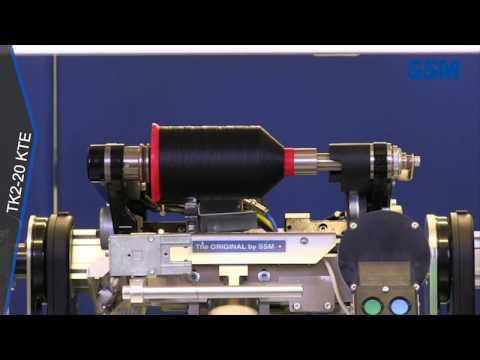 The TK2-20 KTE is a fully automatic Kingspool winder. It is certainly the most flexible sewing thread finish winder for bonded filaments in the market and features by far the highest production performance worldwide. This new development is derived from TK2-20 KT and integrates the unique fastflex™ electronic yarn guide system. This advance technology makes it possible to change or adapt without big efforts the traverse length, the spool size as well as the crossing ratio. The TK2-20 KE is a semi-automatic winder for Kingspools. With the exception of the automatic change, this new development uses the same state-of-the-art technology as the fully automatic TK2-20 KTE winder. Furthermore, this winder offers the same advantages regarding performance, flexibility and operation comfort. This new development comes with the unique fastflex™ electronic yarn guide system. This advance technology makes it possible to change or adapt without big efforts the traverse length, the spool size as well as the crossing ratio. This new development is derived from the TK2-20 CT and uses the same platform, thus it is possible with a conversion kit to switch from a "Kingspool" to a "cone" make-up. The TK2-20 KT offers the same advantages regarding performance, flexibility and operation comfort as the TK2-20 CT. It features by far the highest production performace worldwide. As a standard in the basic configuration, absolutely new product features, such as an electronically controlled tuck-in device and the new slit-drum with "quick-lock", increase the overall efficiency and consequently keep the winding costs to a minimum. The TK2-20 CT sets new standards in the market in combining the highest performance of the well-known THREAD KING series with the functionality and operation comfort of modern control concepts and state-of-the-art drive technology. With its 13000 rpm spindle speed and a maximum flexibility in make-up conversion, this new development features by far the highest production performance worldwide. As standard in the basic configuration, the new product features an electronically controlled tuck-in device and a new slit-drum with "quick-lock", which increases the overall efficiency and consequently maintains the winding costs to a minimum. A synchronized 2-drive system guaranties excellent winding results and the integration of the new lubetex™ control into the winding parameters is a pre-requisite for consistently high quality and best possible reproducibility. The new slit-drum with "quick-lock"
With a special conversion kit it is possible to change from a "Kingspool" to a "cone" make-up on the same machine. The TK2-20 TT is a unique sewing thread winder for small make-ups on cylindrical tubes (cops). 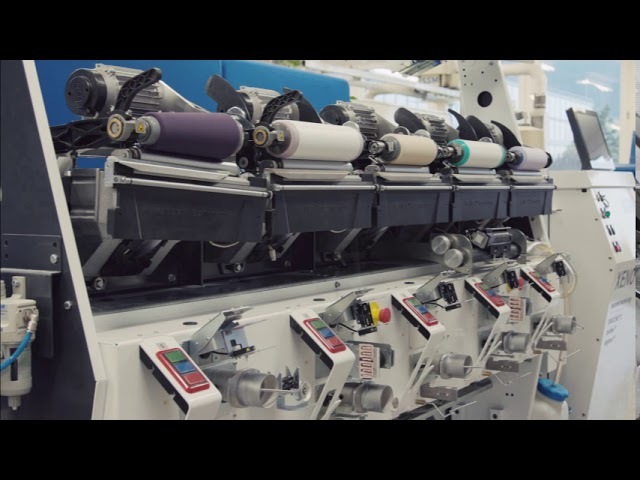 This new development combines the highest performance of the well known THREAD KING series with the functionality and operation comfort of modern control concepts and state-of-the-art drive technology. With its 13000 rpm spindle speed, this machine offers by far the highest production performance worldwide. Furthermore, the high initial spindle speed guarantees a fast and proper under-winding of the start tail, an important factor to avoid any unwinding interference late in the sewing process. As a standard, absolutely new product features, such as the new slit-drum with "quick-lock" and electronically controlled tuck-in device, increase the overall efficiency and consequently keep the winding costs to a minimum, thus matching the new market requirements.